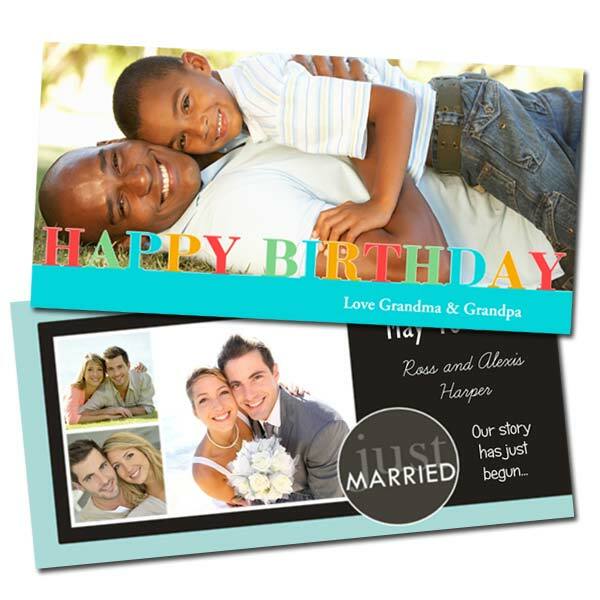 You can find dozens of everyday greeting card ideas or create customized invitations or announcements for any occasion. Our glossy photo card can be designed with a wide variety of elegant, modern and colorful templates for the perfect greeting, announcement or invitation. Upload your favorite photos, browse our collection of greeting photo card styles and let your creativity reign free! All 4×8 glossy photo paper greeting cards can be personalized with text and your cherished memories for a truly professional look. 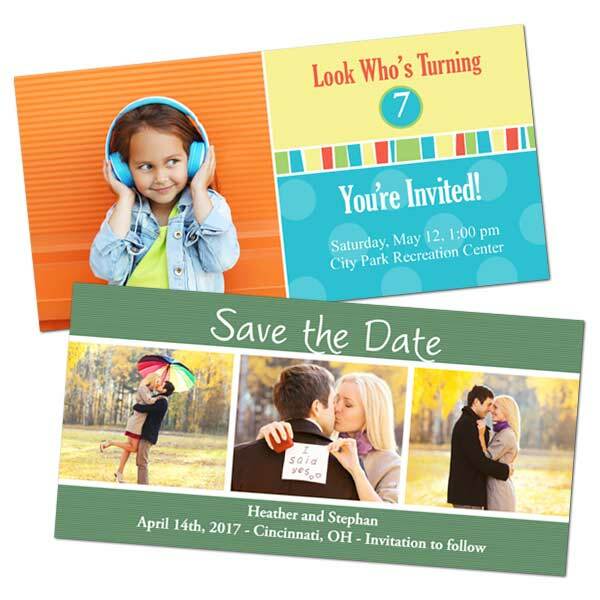 Whether you’re looking to create a photo save the date invites or a custom birthday card online for a close friend, our glossy paper cards are the perfect choice for expressing how you feel in style! 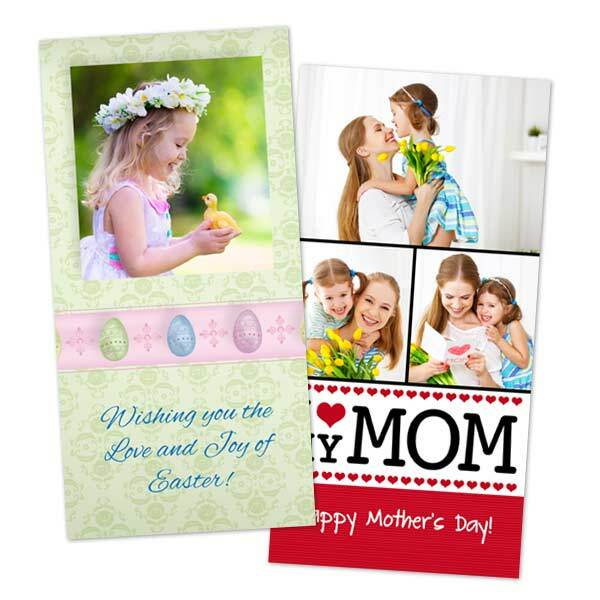 Creating and ordering custom greeting cards online couldn’t be easier and they’re delivered right to your door so you can conveniently write your own personal message and send them out to family and friends. With so many custom options to choose from, the sky’s the limit! Graduation is a time for your senior to reflect on all their achievements and best memories from their school years. Why not create photo graduation invitations to match. We offer a range of collage layouts that you can fill up with your grad’s favorite memories from school years past. Then, include a personalized message to wish them all the best! Furthermore, our glossy photo paper cards are an affordable way of sending your grad invites to everyone on your list at the most affordable prices! MailPix takes photo card printing to the next level with the best prices and results online! Mom deserves the best and your Mother’s Day greeting should be too! Make yours today with a favorite selfie or picture from your phone to include a treasured memory on your card layout! We offer single photo and collage layouts that you can fully customize with a personal message and one of our many Mothers Day card designs! Include it with your gift to Mom to make her day one that she won’t soon forget! Create a Father’s Day photo card that makes Dad smile! In addition to adding your own photos, you can select from a wide range of templates and even add your own text! Glossy photo cards are an affordable, stylish way of creating a meaningful greeting! Why not use your favorite memories to create a card that Dad is sure to love. Making a photo card is simple with our convenient online card maker. Speaking of simple, we also offer easy, cheap Fathers Day gifts! There’s no gift that’s better received than one you make yourself! Great customer service. Prompt and willing to correct an error. Great quality products.